(next entry) The Post-Processor Decoded! Blog / CAMJam 2019 is Here! 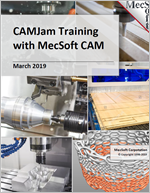 MecSoft Corporation is proud to announce the release of CAMJam 2019, the Video & Document Training Companion set for their popular VisualCAD/CAM®, RhinoCAM®, VisualCAM® for SOLIDWORKS and AlibreCAM® CAM modules. This year CAMJam certainly lives up to its name by being jammed full of both video and document based training materials for new and experienced users alike. CAMJam 2019 now includes over 80 instructional videos covering the complete suite of the MecSoft CAM module functionality including MILL, TURN, NEST, ART and MESH! The set includes the CAMJam 2019 PDF document that indexes and links directly to the content within each video so you know exactly what (and where) to watch to get your questions answered. Learn about all of the new functionality in MecSoft’s 2019 version CAM Plug-ins. Must Watch Bonus Videos including best practices in 2 ½ and 3 axis machining, CAM Coordinate Systems Explored, Mold and Parting Line Machining, Machining Multi-Sided Parts and more. VisualCAD Mash-up with links to every video subject that discusses MecSoft’s free drawing program. All of the MILL Module features including Fundamentals, Feature Detection Machining, 2½, 3, 4 and 5 axis machining. That’s right, CAMJam 2019 now includes 5 Axis machining videos! TURN Machining videos, Machining Scan Meshes, NEST and ART Module videos too! Links to the most popular must-read MecSoft Tech Blog learning articles as well as the latest in-depth case studies of users like you, who are getting the most from their MecSoft CAM software. Bonus Guides and Tutorials. That’s right, CAMJam 2019 now includes training in PDF document format including The CAM Question & Answer Guide, The Cutting Tools Workbook and The 2019 F1 CO2 Racer Body Tutorial, all updated for MecSoft’s 2019 lineup of CAM module plug-ins! 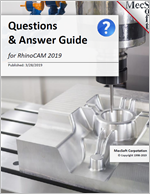 The new MecSoft CAM Question & Answer Guide contains concise information so that you learn quickly. Each question is answered with the menu selections required to complete the task and illustrations to help you understand the results. 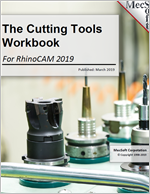 CAMJam now includes the newly updated 2019 Cutting Tools Workbook. This guide walks you through the process of creating tools and using the predefined tool libraries installed with the software as well as creating your own custom tool libraries. Also included is in-depth information on the Tools tab and the Create/Select Tools dialog including the Feeds & Speeds Calculator! This guide also includes worksheets on every tool type supported by the new 2019 MILL and TURN modules! You can print these worksheets and use them to document your existing and new tool inventory for creating tools and setting up your tool library in the MecSoft CAM plugin of your choice! 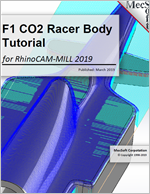 Back by popular demand, CAMJam now includes the F1 CO2 Racer Body Tutorial newly updated for every MecSoft 2019 CAM desktop CAM plugin. This tutorial walks you step-by-step through the process of setting up and machining the Racer Body in a two-sided machining process also referred to as flip machining using both 2½ Axis and 3 Axis toolpath strategies. This tutorial includes comprehensive illustrations to help guide beginners through the process of creating toolpaths. To learn more about being an AMS subscriber and CAMJam just give us a call, chat or contact MecSoft sales and/or support. We will be happy to give all of the details. The 2019 MecSoft CAM Question & Answer Guide!